Some of the largest demonstrations and labour strikes France has ever seen spread across the country from March to July. The action is set to continue in September as hundreds of thousands of workers and students protest a neoliberal labour law forced through the national assembly by the ruling Socialist Party (PS) led by President François Hollande. The government passed the Loi Travail in July without debate or a vote (Hollande invoked a rarely used article of the French constitution that allows the president to rule by decree). The labour reform makes it easier for employers to hire and fire employees, and to impose wages and working hours. Hollande’s reforms, which are opposed by a large majority of the French public, threaten labour rights won by French workers in struggles over the course of the last century. 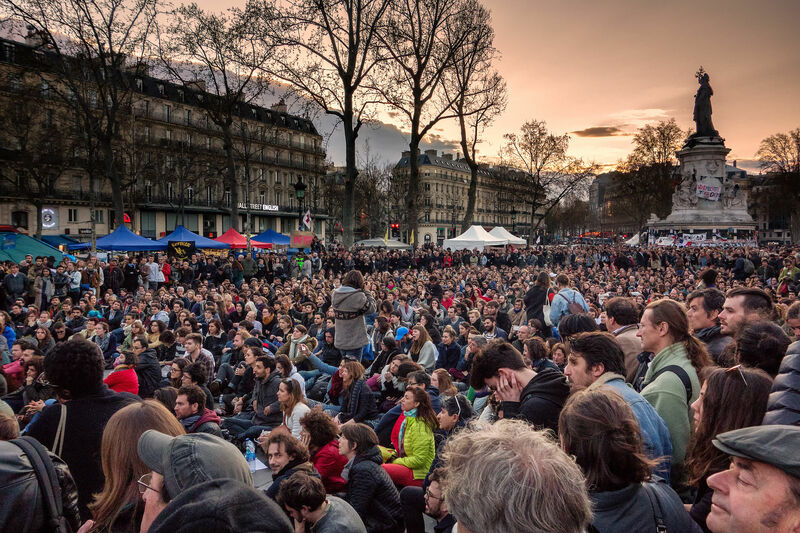 A Nuit Debout in Place de la République, Paris. “This law is not just bad by itself but signifies the destruction of the entire legal architecture protecting workers’ rights in France,” Jean-Yves Lesage explains to me. Lesage is a printer in a newspaper plant who has been a union activist and member of the General Confederation of Labour (CGT), France’s largest union federation, for 30 years. The CGT is close to the French Communist Party and is leading the protests against Hollande’s labour reform. “In France we have three levels of labour laws,” he says. “The national minimum for every person, which is the labour code (Code du travail), laws for each industrial sector, which cannot be below the national standard, and laws for each workplace, which cannot be below the legal standard for that sector. This alarming prospect explains the intensity of the demonstrations against Loi Travail: workers are determined not to submit to what they consider the almost complete abrogation of their labour rights. The official response has been massive police repression. Since March, 2,000 people have been arrested, demonstrators attacked with rubber bullets, water cannons and tear gas. Hundreds of protestors were injured during the biggest gathering so far (an estimated 1.3 million people) on June 14 in Paris. The police response made parts of the city look like a war zone. 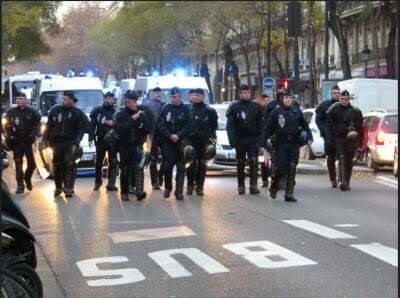 The severity of official repression has been facilitated by the state of emergency declared in November 2015 following terrorist attacks in Paris that killed 130 people. The emergency grants police increased powers to act without judicial consent. House searches can be conducted without warrants at any time and house arrests made. Curfews can be imposed, public movement limited and mass gatherings stopped. Public spaces such as bars and theatres can be closed and media can be censored. A French state of emergency is only supposed to last for 12 days, but the Hollande government has extended it several times. After the Bastille Day attack in Nice this July, which killed 84 people, the national assembly voted to maintain the state of emergency until January 2017. “The French government is using the state of emergency to suppress labour rights and human rights in France,” says Richard Wagman, co-founder of France’s New Anticapitalist Party (NPA), which has also been an active participant in the demonstrations. “Since the promulgation of the state of emergency and the massive deployment of police, military and paramilitary forces, there have been practically no arrests of suspected terrorists. The first arrests carried out under the emergency were those of ecologists who were put in jail for protesting against the climate conference in Paris last December. Muslims in France are treated “violently” by the police, says Florian, who agrees the roots of terrorism lie in France’s foreign policy, especially its attack on Syria. “France needs to stop creating chaos in the Middle East and selling weapons all over the world if its government wants to end terrorism on its soil,” he says. France’s largest business lobby—the Movement of the Enterprises of France (MEDEF)—enthusiastically backs the reforms and has long pressured the Socialist Party to lower labour standards in the face of prolonged recession and 10% unemployment. Hollande, who alongside Angela Merkel of Germany pressed Greece and other European countries to impose austerity on workers, was bound to pursue the same agenda at home. This anger is particularly widespread in France. Hollande came to power four years ago by declaring that his enemy was “high finance.” But he proceeded to serve precisely this sector by enacting unprecedented neoliberal measures against the working class. This betrayal has created widespread disillusionment with politics in France, leading to the phenomenon of Nuit Debout (“Rise Up All Night”). As part of the labour demonstrations over the summer, thousands of people have occupied public squares overnight to discuss politics and economics, and what kind of society they would prefer to live in. The phenomenon, which was inspired by the 2011 Indignados movement in Spain, has spread to other countries in Europe. “It is a modern form of proletarian internationalism in terms of class consciousness and democratic forms of organization,” Wagman says. “People are tired of voting for progressive policies and being deceived. They can see that the political system does not work,” says Florian, who attended Nuit Debout in Place de la République, Paris, where the movement began. “When people do not agree with neoliberal measures and make this clear, the government passes these anyway and this is done by a so-called socialist government which keeps lying and working against the public interest. The CGT has reacted with defiance to the imposition of the labour reform and large demonstrations are planned for September. Asad Ismi is an independent journalist and activist who covers international affairs for the Monitor. This article was published in the September/October 2016 issue of The Monitor.